From Joanna Trollope, one of the most insightful chroniclers of family life writing fiction today, comes a contemporary retelling of Sense and Sensibility, Jane Austen's classic novel of love, money, and two very different sisters. John Dashwood promised his dying father that he would take care of his half sisters. But his wife, Fanny, has no desire to share their newly inherited estate. When she descends upon Norland Park, the three Dashwood girls--Elinor, Marianne, and Margaret--are faced with the realities of a cold world and the cruelties of life without their father, their home, or their money. With her sparkling wit, Joanna Trollope casts a clever, satirical eye on the tales of Elinor and Marianne Dashwood. A fizzy, pop-fiction Jane Austen update....Trollope s comic romp is a satisfying tribute .When Sir John arrives to invite the displaced family to live at Barton Cottage, he gets his laptop out and plays a slideshow of the house. It s a charmer, he tells them. Likewise Trollope s book. --"Boston Globe""
Trollope is a gifted chronicler of modern life and mores; she also clearly knows and appreciates Austen s world. Her update retains the essence of the characters Austen created...with a true Janeite s dry sense of humor and the occasional sly reference to the original. --"St. Louis Post-Dispatch""
Even though you may know Austen s novels well enough to predict exactly what will happen next, you ll care about finding your way to the happy ending of Trollope s version Is the new S&S worth reading? The answer is unequivocally yes...The Austen Project is a breathtaking tribute to Jane Austen. --"Washington Post""
By updating Austen s first published novel to reflect modern slang, dress, and conveniences, Trollope brings an accessibility to this romantic comedy of manners that may appeal to the Bridget Jones crowd. --"Booklist""
Jane Austen s story and Joanna Trollope s voice make the perfect marriage. I loved every page. It s witty and fresh, whilst completely respecting the original, timeless story. What a delight! 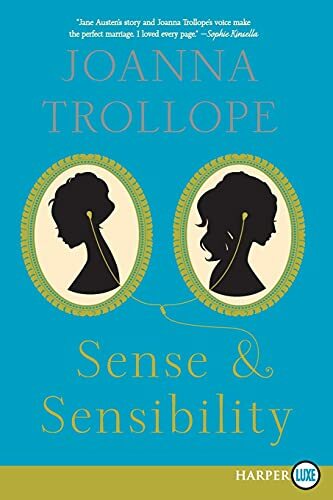 --Sophie Kinsella"
Trollope has clearly had enormous fun with her updating, and part of the delight for the reader is wondering what she s going to do next. --"The Observer""
You don t have to have read the original Sense & Sensibility to enjoy this breezy new take on Austen s 1811 debut .Wittily, stylishly and sensitively written with lots of delicious upmarket detail. A must for Trollope and Austen fans alike. --"Daily Mail" (London)"
Trollope has kept the framework of Austen s novel but modernised the surfaces .Trollope adds verbal fizz. It s a faster, zestier read than the original....A fun exercise and one that provokes serious thought. --"The Times" (London)"
Jane Austen s bestie sisters ditch the corsets (but keep the Downton-style estate) in a 2013 take on Sense & Sensibility. --"Cosmopolitan""
Elinor Dashwood, an architecture student, values patience and reliability. Her impulsive sister, Marianne, is fiery and creative, filling the house with her dramas and guitar playing, while dreaming of going to art school. With her wit and eye for social nuance, Joanna Trollope casts Jane Austen's Sense & Sensibility in a fresh new light to retell a wonderful coming-of-age story about young love and heartbreak, and how when it comes to money especially, some things never change . . .